DUSHANBE, Oct. 13 (Xinhua) -- Muyassar Sadykova, 56, cannot remember how many cold and dark winters she had "lived through and suffered" in the Tajik capital until a new thermal power plant was put into service two years ago. mr.bean, duncanidaho and montyp165 like this. VIENTIANE, Sept. 27 (Xinhua) -- Chinese engineering companies, which are building China-Laos railway in northern Laos, have handed over four bridges to the Lao government. A handing-over ceremony was held on Wednesday in Lao Ministry of Public Works and Transport in capital Vientiane. Li Bingxuan, director general of the Laos-China Railway Company, the China-Laos joint venture in charge of the construction and operation of China-Laos railway, briefed the construction and completion of the four bridges in Attapeu Province in southern Laos, and handed over them to the Laos side. To honor the achievement and contribution of the Chinese engineering companies, Lao Prime Minister Thongloun Sisoulith signed an order of commendation for the Laos-China Railway Company, China Railway No. 2 Group (CREC2) and China Power. On behalf of the government, Lao Minister of Public Works and Transport Bounchan Sinthavong, conferred development medals to the three companies. The fracture of saddle dam D, one of five auxiliary dams at the under-construction Xe-Pian Xe-Namnoy hydropower project, some 560 km southeast of Lao capital Vientiane, resulted in massive flooding on July 23 which has killed 40 people with 97 remaining missing. Over 6000 more have been left homeless. The Chinese engineering companies along the China-Laos railway construction sites proactively responded to the Lao government's request, donating cash and materials to the disaster-hit areas and offering assistance to urgently build four bridges for the access to the flooded villages of Attapeu Province, Li Bingxuan told Xinhua on Thursday. In less than 50 days, the CREC2 and Sinohydro Bureau 10 under China Power, with the guidance from the Laos-China Railway Company, completed the construction of four brand new bridges in southern Laos' flooded Attapeu. 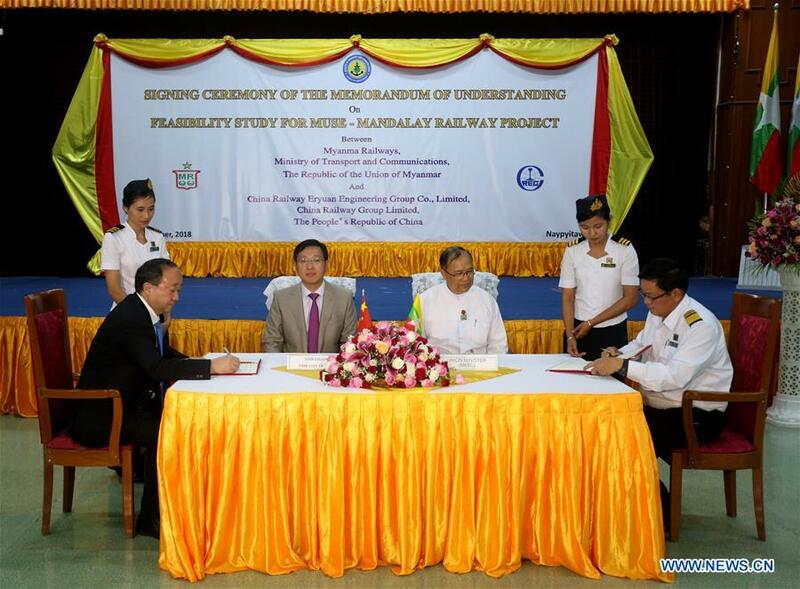 NAY PYI TAW, Oct. 22 (Xinhua) -- China and Myanmar signed a memorandum of understanding (MoU) on Monday to conduct feasibility study of a railway linking Muse, a border town in Myanmar's northeastern Shan state, with Mandalay, the country's second largest city in the north. Under the MoU, inked between China Railway Eryuan Engineering Group Co. Ltd and state-run Myanma Railways, the feasibility study will be conducted within two years covering environmental and social impact assessment. The project is expected to reduce transportation cost, contribute to socio-economic development while conforming to environmental conservation, Myanmar Transport and Communication Minister U Thant Zin Maung said during the signing ceremony. He said the railway, part of the China-Myanmar Economic Corridor, is economically and strategically important, and will contribute to the two countries' long-term paukphaw (fraternal) friendship. Speaking at the signing ceremony, Chinese Ambassador to Myanmar Hong Liang said the railway project will inject new energy into the development of China's Belt and Road initiative and the China-Myanmar Economic Corridor. Hong hoped that the railway will contribute to Myanmar's economic development and peace and stability of northern Myanmar. The railway extends 431 km with a designed speed of 160 km per hour. It will run through important towns in the country's north and some economic hubs. Nothing beats a potential financial crisis to bring geopolitical rivals together. This dynamic was on full display in Beijing Friday when the premiers of China and Japan joined hands on a US$30 billion currency swap, a yuan clearing bank and business deals worth billions. The steps agreed upon by Chinese Prime Minister Li Keqiang and Japanese Prime Minister Shinzo Abe were aimed at spurring business activity between Asia’s top two economies and maintaining financial stability in the region. The timing could not be more significant. The links come just as US President Donald Trump’s trade war throws China’s debt-fueled economy off balance and imperils Japan’s six-year effort to defeat deflation. And the moves are bilaterally significant, in that they appear to override the historical, ideological and territorial disputes that so often dominate relations between Asia’s two leading economies. Hopes are high that they signal an improvement in Beijing-Tokyo ties that were severely strained over the Senkaku-Diaoyu islands territorial dispute in 2012, and have remained so ever since over a range of diplomatic and strategic differences ranging from the South China Sea to North Korea. The results of meetings between Abe and Chinese President Xi Jinping, however, are still to come, and may include thornier political issues than the economic deals done between Li and Xi. Early reports coming out of Beijing lack details, but the meeting between Abe and Li appears to have produced some substantial deliverables. According to Li, some 500 business deals worth $18 billion were officially signed. These included moves to cooperate in developing cities and giant infrastructure projects around Asia. One such joint “smart city” project could be in Thailand, according to Japanese reports. The key outcome so far appears to be the resumption of a bilateral currency swap that was nixed in 2013 – a sign economic realpolitik is entering China-Japan relations, with an unintended nudge from Trump’s tariffs, and possibly as a hedge against the coming financial storm the IMF has warned may be on the horizon. The three-year, $30 billion pact between both central banks aims to enhance financial stability in Northeast Asia and will pave the way for links between financial exchanges that traders long craved. In discussions with Li, Abe’s team also agreed to boost cooperation in securities markets. That includes exchange-traded funds and smoother clearance between dealers and counterparties. The yuan clearing bank to be set up in Japan, meantime, will make it easier for companies and financial entities to conduct cross-border transactions and investments. These two steps should win Trump’s attention. A key priority of Xi has been to reduce the dollar’s dominance in world trade. On Friday, the No. 2 and No. 3 economies began setting up a bilateral infrastructure to at least begin phasing out the US currency. Abe called Friday an “historic turning point.” At least where the dollar’s reserve status is concerned, it may well be. Abe expressed hopes of greater two-way access to finance, health care, infrastructure, logistics and other sectors. Friday’s negotiations also featured talk of a China-Japan-South Korea trade zone – a long-discussed, but so-far unrealized project. Tokyo and Beijing also agreed to cooperate in a series of yet-to-be-named third-country building projects. One area where both sides appeared to agree was in freer trade at a time when Trump’s tariffs loom long over the region. Beijing is being driven into the arms of Japan – a nation with which it has many a gripe – as Washington’s tariff arms-race crimps mainland exports, fixed-asset investments, and purchasing managers’ orders, while slamming bourses in Shanghai and Shenzhen. Abe is also getting hammered as Japan becomes collateral damage of Trump’s China assault. Any hopes his Abenomics would boost wages, confidence and productivity are dwindling with global shares. One solution is freer trade. Abe is furiously promoting the Trans-Pacific Partnership, or TPP, regional free trade model, while inviting key economies to join, including South Korea, Indonesia, the Philippines and others – even Britain. On Friday, according to reports, Chinese and Japanese officials talked about accelerating the Regional Comprehensive Economic Partnership, or RCEP, process. Yet this China-led free-trade pact between China, Southeast Asia and other Pacific Rim powers – including Tokyo – has become bogged down in territorial disputes and hit other speed bumps. Still, given the lack of detail, it is not clear whether the two parties are aligned on the RCEP. Abe called Friday’s flurry of deals a “win-win-win” for Asia’s two economic superpowers, but investors need to keep their powder dry until more details become clear, and Tokyo and Beijing need to think even bigger in the weeks ahead. Even so, Friday’s economic realpolitik could not come at a better moment. Today’s talks in Beijing show what is feasible when leaders push aside disputates and politics and concentrate on what matters. BANGKOK -- As the trade war with the U.S. intensifies, China is looking to strengthen commercial ties with countries in the Mekong region of Southeast Asia by setting up a free-trade zone on the border between Thailand and Laos. "This is the first time that China has offered special privileges via border trade to have closer ties with the Mekong countries and finally to the whole of ASEAN," said Danaitun Pongpatcharatorntep of Chiang Mai University's China Intelligence Center. President Xi Jinping vowed last week to import $40 trillion worth of goods and services over the next 15 years -- a figure that includes products from Mekong nations. While that speech was seen as a bid to counter criticism from U.S. President Donald Trump over Beijing's trade practices, China's move to boost commercial ties in the Mekong region appears to be a way to mitigate the fallout from the trade war. China has poured $1.7 million this year into the Lancang-Mekong Cooperation -- an initiative proposed by Thailand to develop the region. 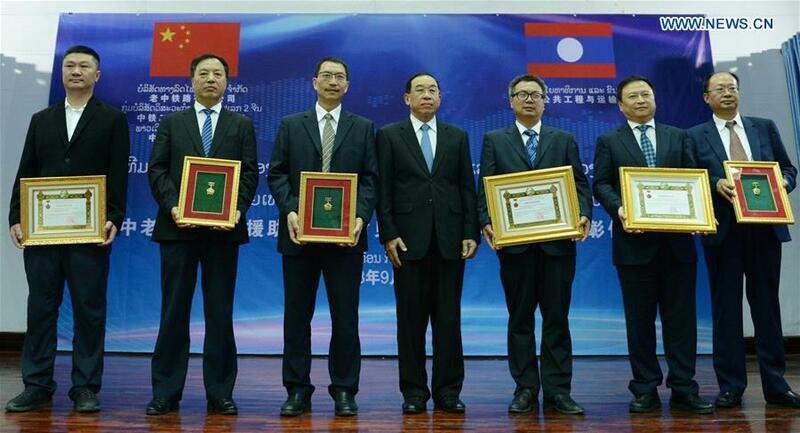 The cooperation came up with the idea of extending the China-Laos border free-trade zone to the Thai-Laos border. Oramon Sapthaweetham, director-general of Thailand's Trade Negotiation Department, said the trade zone will cover an area stretching from the southern Chinese border district of Mohan to Chiang Khong in far north of Thailand. China has already signed a memorandum of understanding with the Laotian government to study a project to shorten travel times on the R3A highway that links the southern Chinese city of Kunming with Huay Sai in Laos and Thailand's Chiang Khong. Work has also started on the Bangkok-Nong Khai high-speed rail line, which is planned to eventually link with Vientiane and Chinese rail routes. Beijing also intends to use the project to capitalize on growing demand for cross-border e-commerce. The Chinese government has built up such facilities and logistics infrastructure with a one-stop customs services in Mohan and other locations along its southern borders. "Thailand is also interested in developing its e-commerce in Mohan and is about to set up Chiang Mai as an e-commerce hub aiming to export more products to southern China," Oramon said. She said the free trade zone will also be a way for Thailand and the Mekong countries to profit from China's flagship Belt and Road initiative by exporting into the European market via China's western border with Kazakhstan. duncanidaho and Equation like this. YANGON, Nov. 13 (Xinhua) -- Work on establishing an economic cooperation zone along the Myanmar-China border has started with the priority given to the Muse (Myanmar)-Ruili (China) section, the official Global New Light of Myanmar reported on Tuesday. Construction will start first on the Muse-Ruili section with the two sides erecting fences respectively, said Deputy Minister of Commerce U Aung Htoo, who is also secretary of the Central Committee to Implement the Myanmar-China Border Economic Cooperation Zone. Government officials from the two sides will continue to hold discussions on the establishment at a border trade expo due to take place in Muse in mid-December with business-to-business talks to be conducted, the newspaper quoted an official of the Commerce Ministry as saying. The border economic cooperation zone is expected to promote domestic and foreign investment, create business opportunities and jobs, help small- and medium-sized enterprises to grow, develop manufacturing power and improve bilateral trade. The economic cooperation zone plan is also part of the China-proposed Belt and Road Initiative to establish a Myanmar-China economic corridor. Myanmar and China signed a memorandum of understanding on the set-up of the economic cooperation zone in May 2017. Equation, Dolcevita and Hendrik_2000 like this. Butuka Campus, a symbolic project of the #China-#PapuaNewGuineafriendship, stands ready to welcome local students to its new campus built under the support of Chinese engineers. The new campus covers an area of 55,000 square meters and features a kindergarten, primary school, and high school equipped with multifunctional. The new campus also has a teacher’s dormitory and is expected to host 2,700 local students. Before the revamp, the campus only had 2,000 square meters of area to host 1,500 students, with poor hygiene and teaching environments. The turning point came in 2016 when the Chinese city of Shenzhen and Port Moresby became friendship cities and the renovation of the campus became listed as the first key project under the friendship MOU. The new campus is reportedly one of the best schools in the Southern Pacific region, with beautiful buildings as well as computers and other experimental equipment to improve the teaching environment. According to Li Pu, the person in charge of the project construction from Shenzhen, the campus not only follows local architecture tradition, but also deploys greener technology in its design. For example, it has a steep roof that can reflect heat and window-shades in the classrooms that can help keep the classrooms cool.